I came across these deer as I was heading into Gardiner on Monday afternoon. A herd of elk were wandering around Mammoth on Thanksgiving morning. I was heading to Lamar but managed to get a picture of them with the terrace in the background. I would of preferred to have a picture of them from their other end but sometimes you just have to get what you get. The trees in Lamar were frosty that morning. The wind would puff a little and flakes would float down down from the trees and sparkle in the sun. It was gorgeous. Two coyotes were mousing so I spent some time watching them make their way through the frost. The Park was incredibly busy and I passed numerous cars on my drive. Many of them were from Minnesota and we would all acknowledge each other as we would recognize the others license plate. A close up of the frost on the trees. When I zoom in on this picture I can see each crystal and flake. After my trip to Lamar I went to Darryl and Judy's for Thanksgiving dinner. All of us from the YGS had been invited. They live in one of the historic homes south of the Visitors Center. I had always been curious as to what those houses look like on the inside and all I can say is they are just as gorgeous on the inside as they are on the outside. Lots of woodwork, a fireplace, tall ceilings and beautiful light fixtures. Darryl and Judy were gracious hosts and we had a great Thanksgiving dinner with old and new friends. People have been spotting a black wolf and a gray wolf in the Mammoth area. We have been finding wolf prints in the snow behind the store. I enjoy wandering around there during my lunch hour looking and following the prints around the store. Today I heard coyotes yipping from the hill behind the store and waited for awhile in case they decided to make a showing. I never did see them but enjoyed listening to them. I haven't seen the bison in the past few days but I did see three huge bull elks by Lava Creek, where they have returned since their visit to Mammoth for the rut. The weather has been decent this past week. The temps have been in the 40's. This morning I woke up to the sound of the snowplow. I love the snow so I bolted out of bed to see that we got about an inch overnight. I can't wait for our first dumping of snow. The temps are now cooling down with highs expected in the 20's. Since the coldest temp I have ever experienced was -58 degrees (Minnesota 1995) and -20 degrees for numerous days was a normal winter experience for me I am prepared for anything Mammoth can throw at me. Thanks to Steve I now know that the National Geographic film about the Yellowstone coyote is called Realm of the Coyote. Thanks Steve for emailing me the info. Great film. So in honor of finding out the name I have included yet another leaping coyote picture. This guy was mousing in Lamar this morning and he spent a great deal of time burying his face in the snow looking for lunch before making this acrobatic leap into the air. The above picture I took of Mammoth this morning on my way back from Lamar. The picture below I took yesterday to show what Mammoth looks like on a snowy Sunday afternoon. If you have only been here in the summer it is hard to believe that it can be so empty. The congestion of summer is gone but in about 3 weeks the hotel will open for the winter season and it will be bustling with activity again. And this is me with a rock and a tree just above the Lamar River on the way into Lamar Valley. For the first time since I've come to Mammoth I finally saw my first bison in Mammoth. This guy was sleeping just off the road half way up to the Yak. I've heard about the bison coming into the Yak and I've been waiting patiently for an arrival. I suppose it can be a bit disconcerting to open your door to find a bison at the bottom of your steps but the Dorm Bison has trained me well and I will know what to: look before leaping, so to speak. Snow has been falling since this morning so the road to Lamar was covered in white (with some ice in some spots). Before I left I made myself a winter survival kit for my car, something I've done for years and have never had to use and hopefully will never have to - but it's there if I need it). In Lamar I only saw a couple other vehicles, which is such a strange feeling. I saw this eagle perched in a tree and while I took its picture a coyote crossed the road behind my vehicle. I adore eagles and I've seen many of them in Minnesota. I even was having a sort of eagle problem when a couple of them decided that my pet ducks were delicious. They would swoop into my duck pen and hold them down and rip their feathers out while I would run out and try to shoo them away. I guess I'm not very intimidating to an eagle because they would just kind of look at me and then fly onto a low branch and study this odd human behavior of running around with arms waving. Most of the ducks were too heavy to carry away but occasionally they would grab a young one and I would see it in the grips of an eagle as it quacked out of sight. So that is my experience with eagles. Though I've lost a few pets to the species I still admire them. I also had another coyote cross in front of my car by Pebble Creek and I watched him mouse for awhile. I take a lot of pictures of the coyotes I see. I seem to be accumulating quite a collection of pouncing coyotes pictures. Am I tired of seeing the coyotes? Absolutely not. I remember years ago watching a National Geographic (I think) show on a Yellowstone coyote who was run off from his pack and his trials of trying to survive on his own, find another pack to join, and finding a mate. If anyone knows what show I'm talking about please contact me so I can figure out how to get a copy of it! This is off the topic but I once watched a National Geographic show when I was a kid about a pelican during the dry season in Africa. After investing an hour watching this poor pelican try to survive the final scene was of it's dead carcass laying on the parched ground. Aaagh! I like the happy endings and I do remember the coyote show having a happy ending. My alarm clock this morning was the dragging blade of a snowplow as it came by at 6:30. When I hear that noise I know it snowed overnight. There wasn't much snow on the ground, an inch or two, but I love the white and it makes everything look so much more beautiful. It is sunny here now but I can see the clouds dumping some more snow up in the surrounding mountains. A couple nights ago my neighbor had saw a wolf in the Yak and the next morning came out to find wolf prints around the road and his vehicle. It had been chasing an elk down the road and across a boardwalk one row over from my place. I've heard numerous stories about the wildlife coming into the Yak and I'll be keeping my eyes and ears open for the animals. The elk were by the store yesterday. A couple younger bucks like to tussle around with their antlers. I sat outside yesterday afternoon to watch 3 elk graze behind the store. They would grab the stem of some long vegetation and pull it through their mouth as they stripped the leaves off. I could hear the stalk of each plant squeak through their mouths. It was entertaining and then a little rabbit came hopping by their feet. Earlier in the week I found coyote prints in the parking area behind the store. I always look around when I head back to the garbage dumpster, I'm never sure what I will see. The following are pictures that I took this morning at the request of Rick in Atlanta. If you have ever been to Cooke City in the summer you know that the place is packed. This time of year when the snow levels are still low it is a much quieter place. Once more snow comes it will be bustling with snowmobilers. It is a very picturesque town surrounded by mountains and a great place to stop for a refreshment after a trip over Beartooth Pass. While in the area I thought I would snap a picture of Silver Gate. I have only driven through the town but I think this would be an interesting place to stop at during the summer when everything is open. A friend of mine does snow removal in the spring and gave me some pictures that show some of that process. These pictures were taken this past spring. The first picture shows how much snow accumulates by the buildings in Canyon Village. 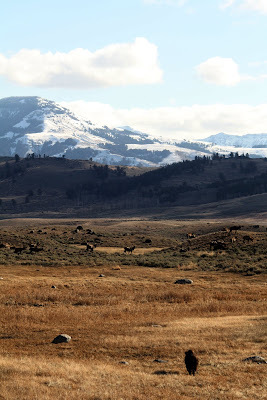 Here is the Yak Camp, where I now live in Yellowstone. It is hidden from the roads and overviews so many people don't know it even exists. The only view of the Yak is from the trail up to Bunsen Peak. The Yak is home to seasonal park service employees, some Xanterra employees and 2 of the 5 winter YGS employees. There was quite a snowfall to the north of here yesterday. Bozeman received about 18 inches and Livingston was hit, too. As for Mammoth we got about 2 - 3 inches with more toward the Norris area according to workers traveling in the park. It was beautiful coming down and the surrounding mountains look awesome with the snow cover. Larry stopped in the store yesterday (Hi Larry!) and showed me some of his great photos. He is quite a good photographer and a self-proclaimed 'wolf magnet'. And from of the pictures that he has taken it appears he is quite right. Taco Tuesday went great. I had one for lunch and it was delicious, probably the best I had ever had. 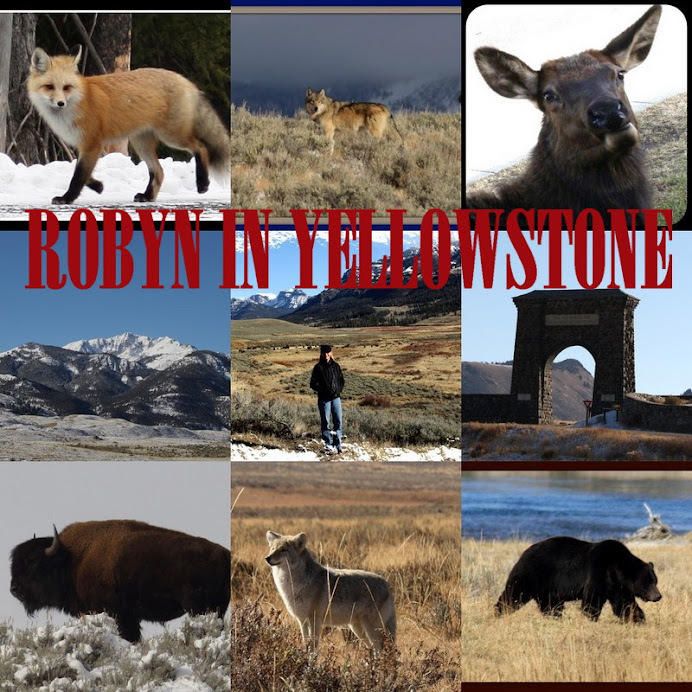 Come on in to Yellowstone and try one. Yesterday I decided to head to Lamar Valley. My day could not of started out better as when I was just east of Blacktail Ponds I noticed two wolves trotting along just off the road. I grabbed my camera and immediately realized that I had the wrong lens on. So between fumbling with a lens change, shifting the car into park and rolling down the window I managed to to develop a case of the shakes in fear of missing the opportunity to photograph wolves that close. That is when I noticed that there was a third wolf. Joy, oh, joy! I hadn't seen a wolf in a couple of months so this was quite a treat. I also found some wolf prints in a parking area nearby and was quite impressed with how huge they were. I drove through Lamar Valley and decided to continue on further. I was impressed with the ice hanging in Ice Box Canyon and found the snow covered mountains inspiring. I continued all the way into Cooke City, though it was a rather slow day in the town as I only saw one other vehicle on the road there and it looked like it had been parked there for awhile. Coming back through the gate into the Park a beautiful red fox appeared and wandered back and forth across the road while I pulled over to watch. Once again I spent some time watching a mousing coyote by the Yellowstone picnic area. She was quite a dainty thing and wasn't having much luck catching anything she pounced toward. She would very femininely pick up her feet and slowly and deliberately step over long blades of grass laying over the ground. I hope she learns to toughen up. I also found some more wolf prints in the Slough Creek parking area and had a good time following them around the area taking pictures of them. I saw another coyote wandering away from me in Lamar (still not tired of seeing them though) and got into a mini bison jam by Soda Butte (which is were my new header picture was taken). With about 150 pictures to sort through I decided to I better head back, sort through them, and share them on my blog. And now I head off to rest up for tomorrow, the first day of "Taco Tuesday Winter 2009". Yup, it's that big of a deal around here. Not much to report from Yellowstone. The weather has been perfect this past week, it even got into the 60's here in Mammoth. However, the wind blows here on a regular basis and it is a strong wind that shakes the place that I live. The elk have been wandering Mammoth and I even came across them as they crossed the road in the dark after work. I've even seen the occasional rabbit hopping around. The Fountain in the store is gearing up to start serving food. I'm looking forward to that as well as the numerous park employees looking for a hot lunch. I have been meeting some great people. I met the person in charge of the Buffalo Ranch in Lamar Valley who invited me down to take a tour of the place. I have never been there and I'm looking forward to doing that. My only days to do wildlife watching will be Sundays and Mondays. It is too dark after work to see anything but I do get the chance throughout the day to watch the elk and look at the terraces from the store window. This photo shows how the elk crossed the valley in single file while a bison looks on. I've decided that driving through Yellowstone now is like taking a trip through time. Maybe not a time frame of a few thousand or million years but of the past few months. I find that as I pass certain areas of the Park I am remembering what I had seen in those areas. "I remember the time I saw a grizzly bear here." or "I remember when I saw a baby black bear cub hanging from a limb here." And yes, I have the occasional "I remember when that idiot stopped right in the middle of the road and ran over the hill with his camera here." Right now I know I will someday be driving along and then recall how I watched the elk crossing over the valley in single file. I saw this little fella this morning and this picture just goes to show that littering is very bad. I hope he didn't end up with a belly full of plastic. This is just a few of at least 100 bulls and cows that I saw walking across the valley in single file this morning as I headed to Lamar Valley. I enjoyed this sight the most because of the herd of bison walking across the mountain in the background. This is the partner to the plastic water bottle carrying coyote. I had to add this caption to the picture because for a time he seemed completely oblivious to the herd of bison coming his way. Yesterday and today are my days off and I spent most of the day curled up in my recliner. I was feeling a bit under the weather and decided to relax. In the afternoon I got to see Barney, a co-worker from Canyon, when he came back to help Connie (co-worker from Canyon and also a co-worker at Mammoth this winter) move her trailer from Canyon to Mammoth. I hadn't seen Barney is about six weeks and it was great to see him again. His wife Becky is a regional auditor and I've been seeing her a few times a week since coming to Mammoth but now they both will be gone for the rest of the winter. With what appeared to be another beautiful day brewing (in the 50's yesterday) I decided to head to Lamar Valley this morning. All the other roads in Yellowstone were scheduled to be closed as 8:00 am so I knew that today was the day that I would start my next 6 months worth of treks to Lamar. Rounding a corner about a mile west of Hellroaring I came across two coyotes meandering in the road. Just past them was a herd of bison walking down the road toward me. I took a few pictures of them through my windshield (the pictures came complete with some glare - darn) but when the coyotes came by the side of my car I got some out of my open window. I had noticed that one was carrying something and eventually realized it was a plastic water bottle carelessly discarded by someone. Following the buffalo chips on the road I could tell that the herd had spent some time on the road and had originated by Floating Island Lake where there was another herd. I watched them for awhile before continuing on. I eventually came to quite a sight before heading into Lamar. It was a herd of about 100 elk walking in single file and crossing the road. Some would get spooked by something and trot back until a bull elk would make them turn around and go back. There were bulls of all ages and sizes, some very large and some just yearlings and there were a few bugling to each other across the road. It was a great sight and one that I hadn't seen of this proportion. When I finally got in Lamar Valley I found that I was going to experience quite a treat. From the time I entered the valley, drove to the far end, and drove back out I had seen approximately 10 cars! Unbelievable. It was just me, 4 coyotes hopping and jumping by the Lamar River and those 10 vehicles. I'm sure if I would have spoken I would of heard my echo. There were not any bison in Lamar that I could see, and even though I scanned the entire valley I saw no wolves.